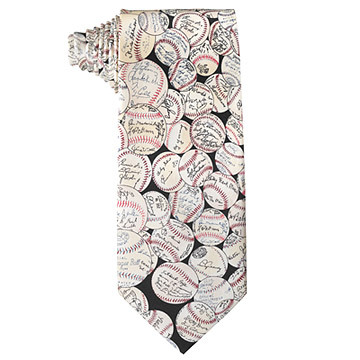 This silk tie features signatures from baseball legends like Babe Ruth and Ty Cobb. Perfect for any guy who ever dreamed of playing in the Big Leagues, this tie, featuring signatures from all-stars like Babe Ruth and Ty Cobb, will bring back fond childhood memories. Made from silk and printed with various shades of cream and tan to look like an authentic worn-out baseball. I would recommend this for any guy who is a baseball fan. Unique gift for a baseball fan. I would give this as a gift again. I would but this tie again. The man who received the tie was happy and he liked it! He thoroughly enjoys watching baseball. The tie was the perfect gift. Uneven pattern. Poor quality silk. Dad's gotten a lot of compliments on this since he received it. I was worried about the quality of the silk because of the price, but it was great! This tie looks great on yellow, blue, and white shirts. I was quite impressed with this tie! The tie is beautiful. The quality is superior, the style is unique. My friend will be happy to get it and that's what gifts are about. He is a rabid baseball fan.